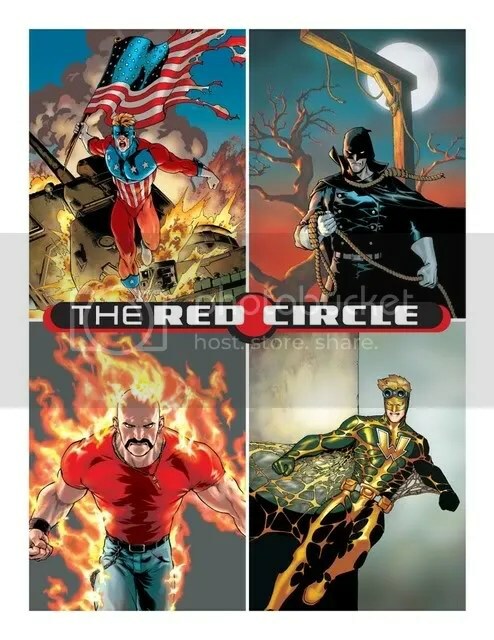 You may have heard that the Red Circle characters were coming to DC. You may not have had a clue what that meant. Then, you may have heard the Archie super heroes were coming to DC. 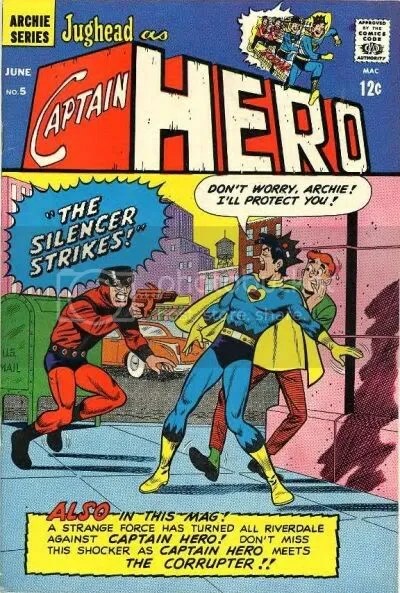 You may have wondered how Jughead in a cape was going to be folded into the modern DC Universe. And, that is when I got excited. 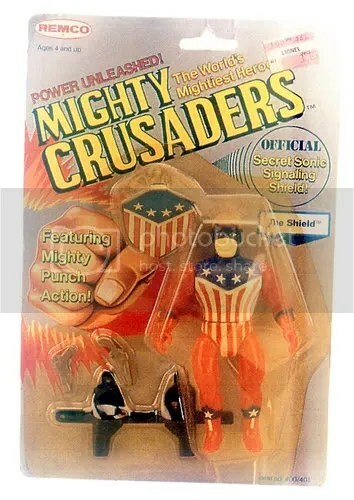 See, when I was but a young geek, I had the action figures of the Mighty Crusaders. My family wasn’t exactly rolling in the dough, so when it came to little chunks of overpriced plastic (ie, action figures), I didn’t have all that many. 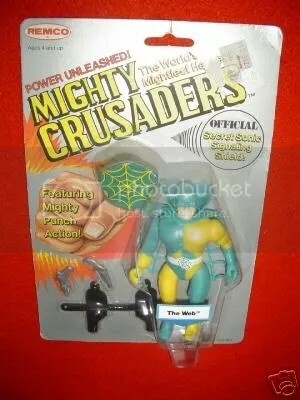 When the Mighty Crusaders came out, though, they were significantly cheaper than other figures. And thus, I had them. 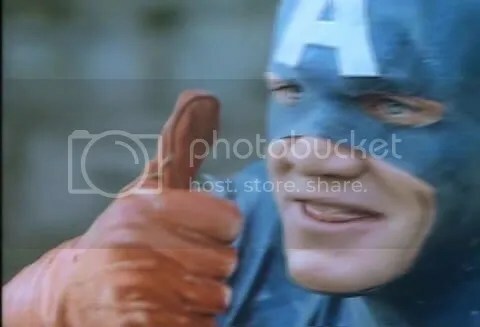 In all honesty, I didn’t know much about the characters at the time, and very often used the Shield as Captain America and the Web as Spider-Man (which, admittedly, was a bit of a stretch), but I came to really like the toys, and eventually learned about the actual characters and enjoyed them a lot. Which is one of the heartbreaking things about revival of these characters at DC. 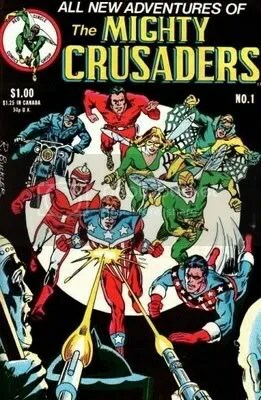 A little while back, they issued four one-shots of the Shield, the Web, the Hangman, and the Inferno (again, I admit, I was less familiar with the Hangman and the Inferno… because they weren’t members of the Mighty Crusaders), and I bought all four. The one-shots were pretty crummy, and connected, which meant that if you didn’t get all four, you were missing out on the story. And, if you did get all four, you just felt ripped off. When the ongoing Shield book was announced, though, I thought I’d give it a chance. The one-shot, while not great, was probably the best of the four, and I was able to get the first issue at a great discount. (In case you haven’t noticed in my previous postings, I’m cheap.) Even if it was crummy, I could pass it along to someone else (Christmas is coming, and I find comics make great padding in packages being sent out!). I was glad I had read the one-shot in preparation for this first issue of the ongoing. 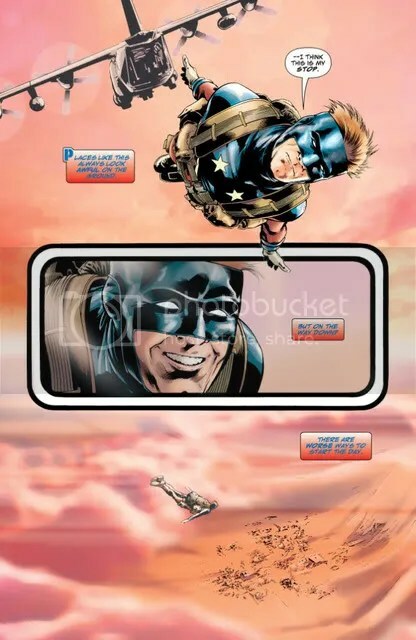 I’m pretty sure I would’ve gotten the gist regardless, but knowing the Shield was an injured soldier, saved by experimental technology via his suit, helped. In the story, the Shield is sent to locate some Special Ops Units that have gone missing. Unfortunately, they’ve gone missing in an area that is particularly sensitive about costume-clad heroes coming in – the Bialya/Kahndaq border. After speaking with the Mullah of the local village, the Shield is led to the location where the missing men are likely being held… and is attacked! Not by the insurgents, though. He is being attacked by the missing men! While trying to keep the men from killing the boy that led him to the location, and keeping the boy from killing the men as well, the scene is interrupted by Magog! Ooh, exciting… except, not so much. This big reveal of a guest star from the DCU in the next issue was… disappointing. Up to that point, the comic was really intriguing. First off, it had a great feel. 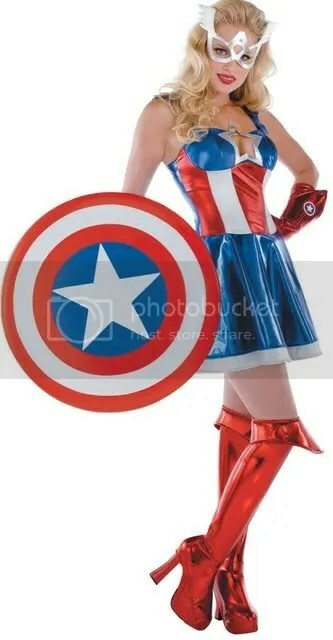 If I had to describe it, it would be a nice blend of Captain America, with a bit of Iron Man thrown in. 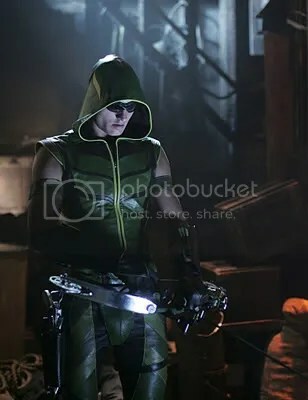 There was definitely a nice military feel, and the Shield was definitely presented as a soldier, but there was also the science fiction element of the suit thrown in. Even having the men attack the Shield was a bit unexpected, and let the reader wonder what was really going on. 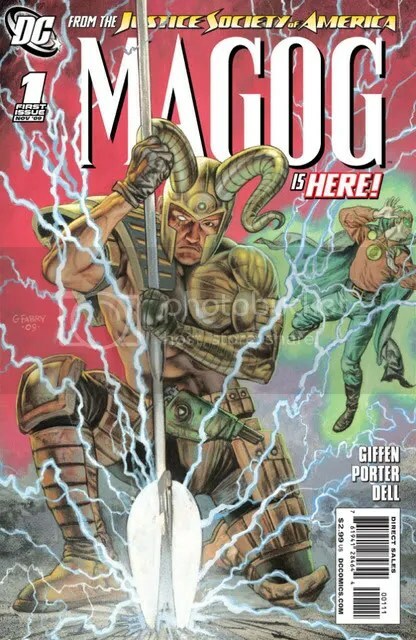 But, then, Magog was shoe-horned into the book. And, personally, not being a fan of that character, I was immediately deflated by his appearance. The art throughout the story was good, and fitting for the book. 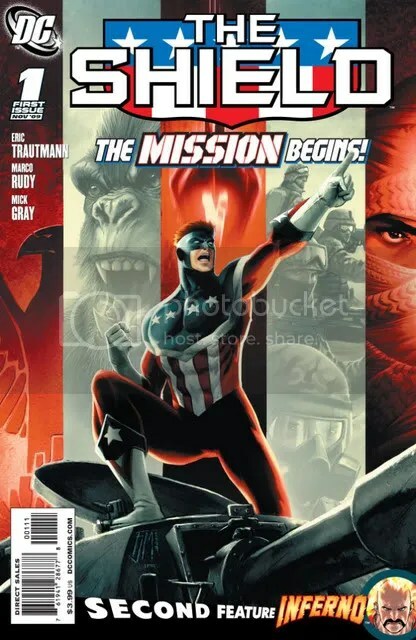 Perhaps a little too clean, but that could just be that it had the same feel as the most current run of Captain America, and the art style there is darker, which in turn makes me feel that maybe this should be as well. Along with the Shield in this book, though, we are also given the back-up (I don’t care if you call it a co-feature or a second feature, DC, it is still a back-up) of the Inferno. I won’t go into the story there. I read it, and it was “eh” – plenty forgettable and I don’t think it paired well with the main character in the book. The art was fine, but nothing extraordinary. So, what is the verdict? Well, sadly, The Shield has three strikes against it. Strike one – the abrupt, unnecessary, and unwanted inclusion of a guest star right at the end. Strike two – the Inferno second feature really brought down the momentum established in the main feature of the book. And, strike three – cover pricing a new, unestablished book at $3.99? 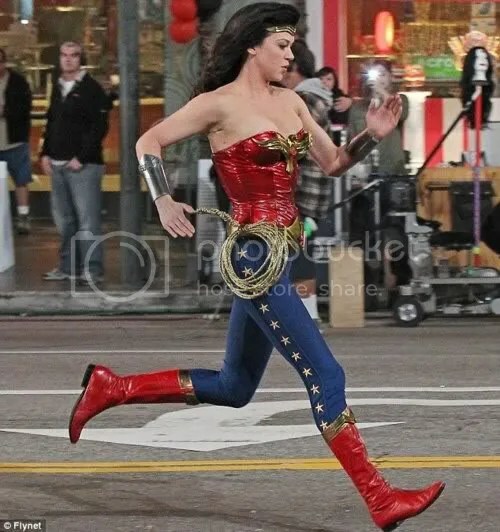 Really, DC, what are you thinking? Kill the back-up story and bring this in at $2.99! Even with the strikes, though, I really enjoyed most of the first issue. For that reason, I’m giving the book two and a half Running Steves. When it is collected as a trade, I might pick it up, but it didn’t pull me in enough to buy every month. Honestly, this is a tough book to summarize. I mean, I’d love to just start with the concept and say, “What if the X-Men were translated into the world of the crime drama of the 1940’s?” But, the truth is, this is no where near that easy to describe. Nevertheless, I’ll endeavor to give an idea of what goes on in this book..
A body washes up on Welfare Island, a redheaded woman with an “X” tattoo, covered in slash marks, grouped in threes. The “X” tattoo brands the woman as someone that spent time in a reform school run by former psychologist/current convict Charles Xavier. Xavier is in prison after it is discovered that he was training his pupils, honing their criminal abilities. Even without their mentor, though, the “X-Men,” as they call themselves, are still active in the criminal world. 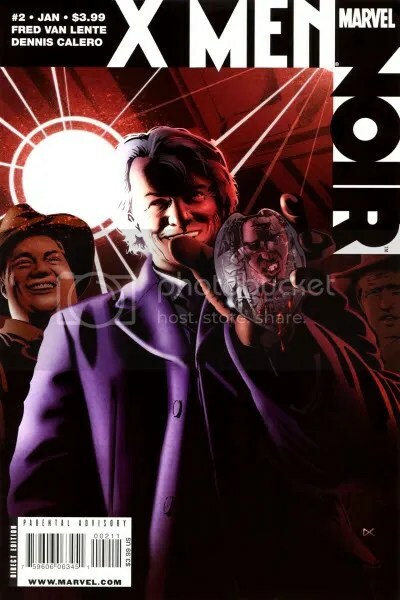 At the scene of the crime, we are introduced to young detective Peter Magnus, son of the Chief of Detectives, Eric Magnus, whose life is turned upside down when he finds out that his father is under the thumb of the criminal organization known as the Hellfire Club, and that the organization essentially runs the city. As the story progresses, we see a lot of characters with familiar names, but wildly different personalities than we are used to in the regular Marvel Universe. The story essentially splits early on, and we are left with one story loosely following Peter Magnus, and the stronger story following Thomas Halloway. The two do eventually come together, but not in a way that seems particularly necessary. After the completion of the Magnus storyline, we follow the Thomas Halloway as he eventually discovers the murderer, and discover a couple of surprises along the way. 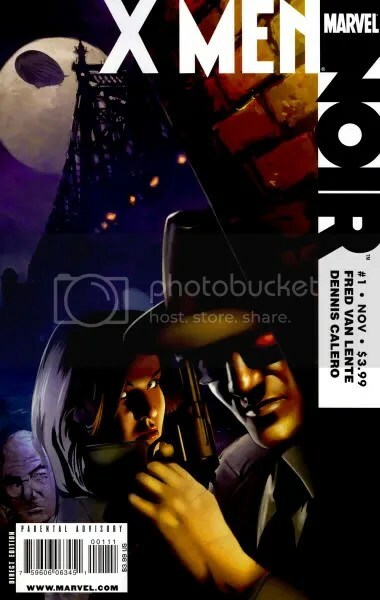 Along with the sequential art story, we are given a prose science fiction story, a throwback to pulp stories, that also references a lot of stories and characters from the Marvel Universe. I’ll admit, I don’t regularly read any X-titles right now, but I’m familiar with the characters. If you are coming to this title expecting “What if…” versions of the X-Men you are familiar with, you are going to be disappointed. For the most part, only names and the slightest essence of the characters are taken from the known mythology and applied to this new setting. Which, in and of itself, isn’t a bad thing. 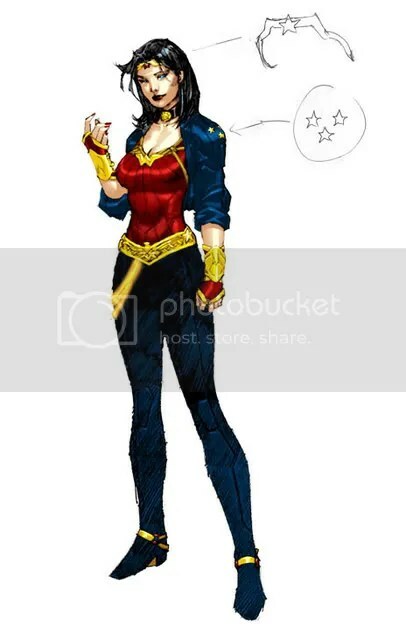 It is not a new idea, and has been used with varying degrees of success in other projects (the “Just Imagine Stan Lee…” and Tangent Universe titles from DC, and the Marvel Mangaverse spring to mind immediately), so the concept is valid. The execution, sadly, is not great. The characters in this story seem to sit on a fence. Instead of breaking completely with the characters of the regular Marvel Universe, the writer gives the characters moments of connection to those counterparts, but it is often tenuous at best. For example – Quicksilver is fast, so there is a line where Peter is referred to as fast… and that is about it. Given that the story is so completely breaking with the “normal” of the regular Marvel Universe, I can’t help but think that a clean break would have better served the story. There are also a lot of characters thrown into this story. We are being introduced into this world and narrowing the focus on fewer characters would have let us get to know those characters a little better, which would have been a major benefit to the story. I also found the split story was a detrement. When I first started reading, I thought Peter was going to be the central character of the story, but quickly learned that his was essentially a pumped up subplot. 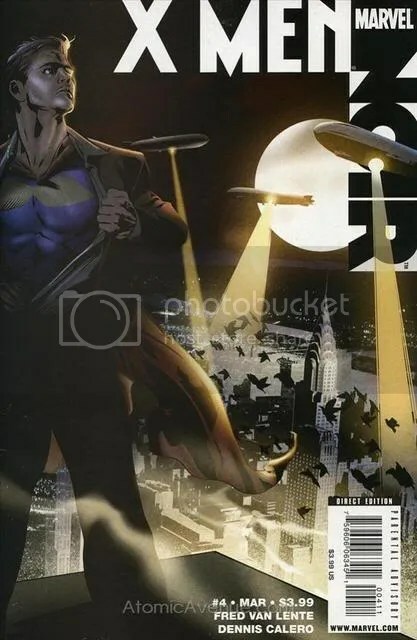 Had that aspect been removed from the book entirely, allowing more focus on the single mystery where we followed Thomas Holloway, I think the entire story would have been more engaging, and certainly tighter. The prose story is kind of a highlight of the series, but seems completely out of context with the story. I kept looking for some parallel (other than “Look, here’s another story where we use names from the X-Men universe”), but if it is there, I failed to grasp it. Still, it is a neat homage to pulp science fiction of yesteryear. And (this may be a first for me), I found the word balloons/lettering distracting. It is hard for me to nail down exactly why I found them so distracting, but I think the lettering is too small for the balloons. It allowed for a lot of white space around the lettering, which, given the color tone of the pages, really stood out. Overall, I found getting through this series difficult, with just an okay story and lots of shortcomings. As a result, I’m giving this one and a half out of five Running Steves. I may have dropped it down to just one, but I got the hardcover from the library, and since I didn’t have to pay to read this series, I’m feeling generous! ‘allo, ‘allo, ‘allo! And what ‘ave we ‘ere? Why, boil me beef and call me Nigel, it’s another Preview Review! 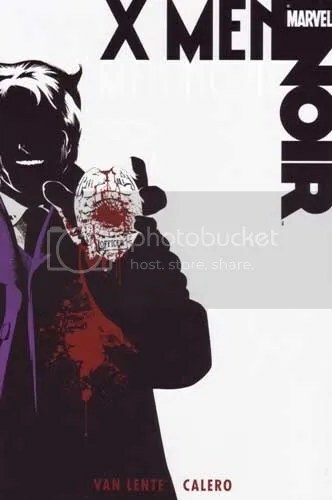 For those of you not in the know, this is a Preview Review, wherein I find the unlettered preview pages offered online for an upcoming comic (that I really have no intention of buying), and write a review of the issue based entirely on my perceptions of what is going on. Despite the shortage of unlettered pages being offered for preview (a conspiracy, I maintain, directly against this here blog), I, your humble host have manage to procure some pages from the forthcoming Spider-Man Loves Mary Jane #1. Wait… #1? Hasn’t this series been going on for a while? I thought it was up to, like, issue 20 or so. Oh, wait… now I get it. 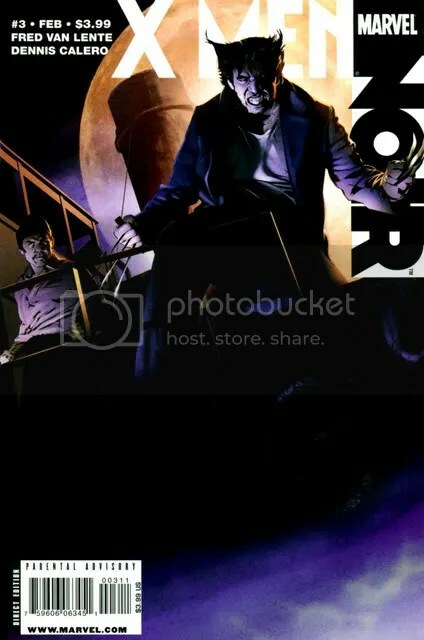 New writer, and Marvel decided to cash in by slapping a #1 on the cover. I see right through you, Marvel. Can’t fool me. Not about drugs? A teenage girl in love? 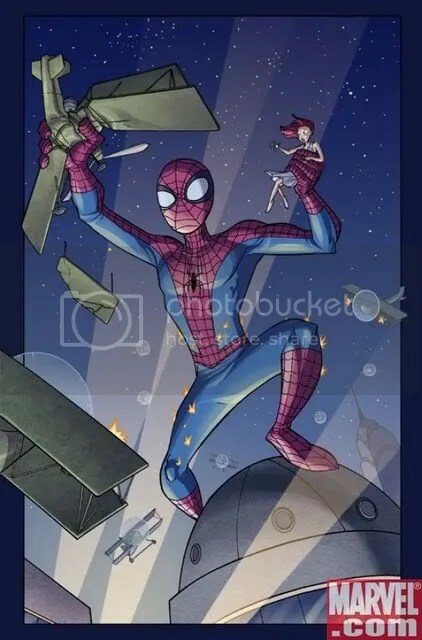 As I was saying, today we look at Spider-Man Loves Mary Jane, written by Terry Moore, art duties by Craig Rousseau, with a cover by Terry Moore and Adrian Alphona. Let’s see that cover, shall we? Oh, wow… its so… symmetrical? Yep. Main subject posted front and center, grass on both sides, a tree on each side, background pretty sterile. Hold on a minute – that lampost is only on one side. Moving of from the general composition of the image, we can take note that New York is filled with actual ivory towers, broken up by only the occasional line or square. Most folks that don’t live in New York don’t know that. I can already tell that this comic will be very informative. And there stands Mary Jane. Young, innocent, completely unaware that in the future, she will make a deal with the devil and completely screw up Spider-Man’s continuity. Splash page! Alrighty, on this first page, we have… well, it look like M.J. is laying on a big canvas on which someone has pencilled a few faces. And, it also looks like she’s rubbing out some of the images. You know, that’s irritating. I mean, someone sets up a canvas, pencils in some light drawings to get ready to paint, and along comes Lil’ Miss “Spider-Man-Loves-Me-I-Can-Do-Anything-I-Want,” who decides to just lay down on the canvass. Anyway, what else is going on here? Well, M.J. has a lot of hair. Don’t get me wrong – very shiny and well maintained (she probably buys some really expensive conditioner), but she could do with a little trim. I just realized – that hair is probably why she is lying down. The weight of it exhausted her. Now I feel kinda bad for judging her too quickly. Sorry, M.J.
Aw, she has a cute little Spider-Man doll. 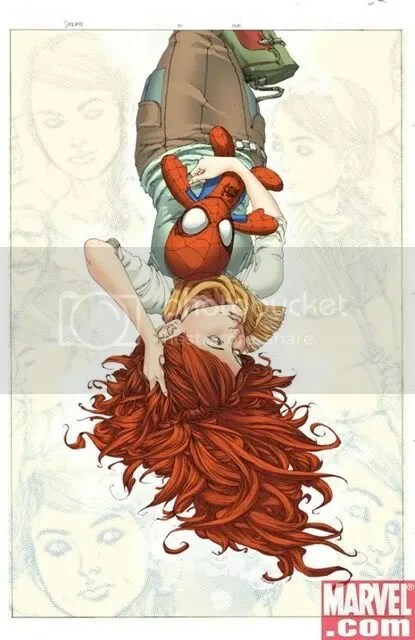 You know, I can’t decide if it is a good thing or a bad thing that Spidey can give a doll of himself to a girlfriend. 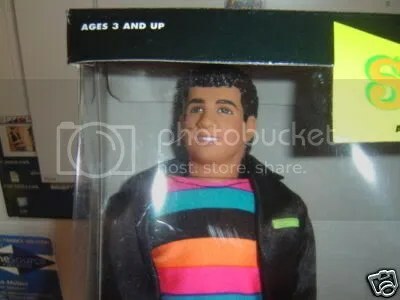 I mean, it is neat that those things exist, but it seems a little creepy, maybe a little controlling, for a guy to give a doll of himself to his girl. 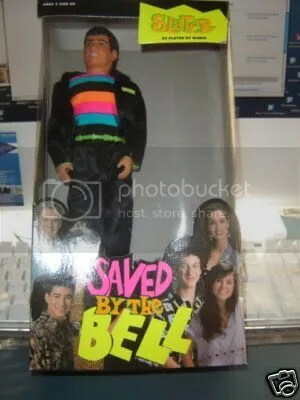 I mean, you don’t think that Mario Lopez gives out those Slater dolls to girlfriends, do you? Let’s just go to the next page. Splash page! This comic is going to be a really quick read if this keeps up. Twenty-two glorious single image pages! Thirty seconds of entertainment for only $2.99! What a deal! 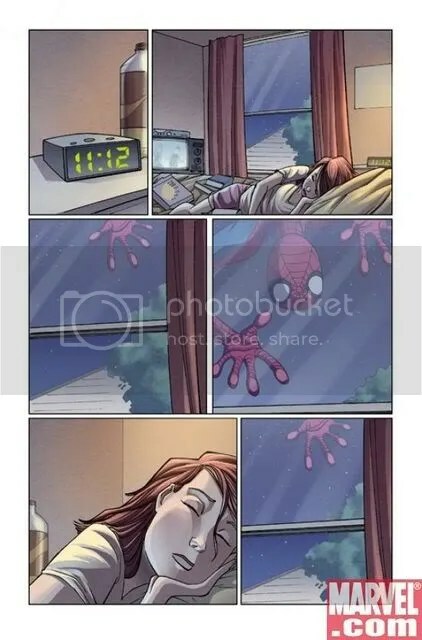 On this page, we get to see that Spidey also has a doll of M.J. I guess that’s okay, kinda like a reciprocal gift of young love. You know, like when you see boyfriends and girlfriends wearing identical shirts… which is actually kinda nauseating. But, they are young and in love and do stupid things like that. I’m not certain why Spidey is crushing one of his model airplanes, though. Maybe we’ll find out on the next page. Hold it right there! That M.J. doll is emoting in this first panel! Unless that is one incredibly expensive doll, I’m guessing it isn’t a doll at all. It is Janet Van Dyne, a.k.a., the Wasp! And, she appears to be dressed up in some sort of Mary Jane costume! Oh, no… I don’t like where this is headed. Panel 2, Spidey looks back at Janet. Say it ain’t so, Spidey! Then, in the third panel, their eyes meet. I can’t believe you would do this to M.J., Spidey. Have you no shame? Cheating on her, making the Wasp dress up like her… oh, man… this is wrong AND creepy. The next panel, Janet moves in for the kiss. I can’t watch this. It is just so wrong! Last panel on the page – a reprieve from the creepy, as someone fires a bazooka at Spidey! He appears to be the same size as the Wasp… which means it must be her husband, Hank Pym, a.k.a., Ant-Man. 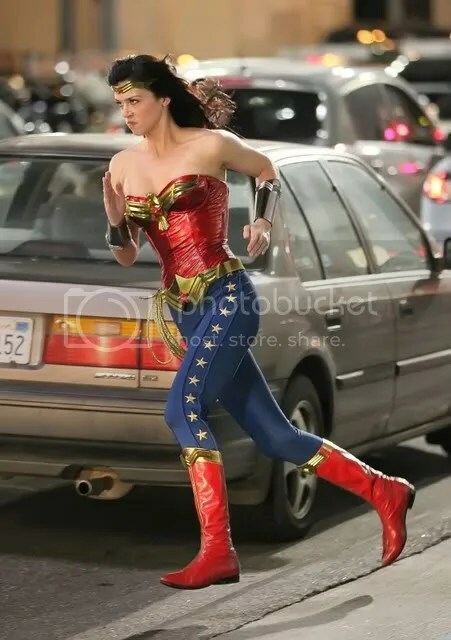 How will the superhero community survive all of this? Hero against hero? All for what? The creepy desires of Peter Parker. It is just disgusting. Move on to the next page. Oh… well, that is a startling change of pace. We are now in what appears to be a classroom, where M.J. is blissfully unaware of the two-timing activities of her love. We also learn another previously unknown to most people fact – Mary Jane’s arms. They are gorilla-long. Seriously, why is she passing that note to the blonde girl to pass to that sulky kid? 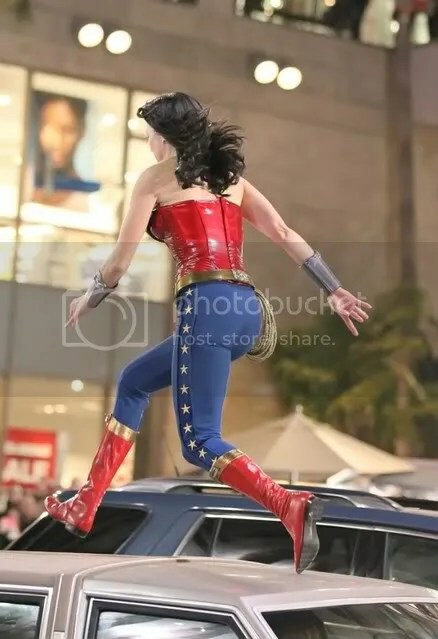 I’m pretty sure if she fully extended that arm, she could open the window. And why is she passing a note to the sulky kid, anyway? Oh – maybe it is a friendly note to try to cheer up sulky kid. It really is a nice gesture on her part. 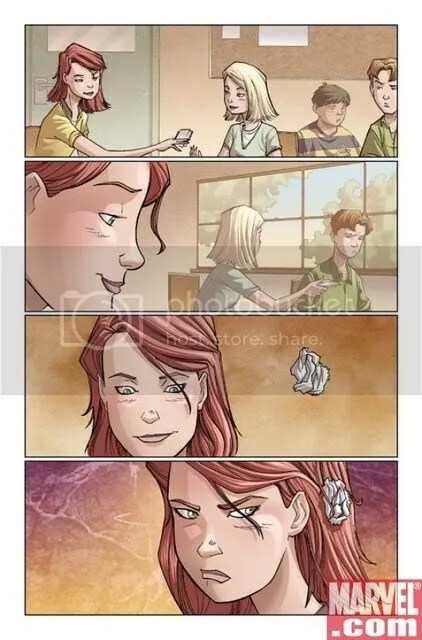 In the following panel, M.J. looks on happily as the blonde girl gives the note to the sulky kid. She is likely thinking on the coming appreciative smile from sulky kid. By the next panel, M.J. has returned to her studies, and… a wadded up tissue floats in the air near her head? Or is it orbiting her head? I must admit… I’m a bit confused here. Maybe the next panel will explain things a bit. Nope, no help at all. The wadded up tissue has now crashed into the side of her head, irritating M.J., as well it should. On a quick sidenote – are those walls behind her made of marble? What kinda budget do New York schools have? Okay, it is 11:12 p.m. (Thanks for the time update, Craig Rousseau!) In the next panel, we see a tuckered-out M.J., asleep in her clothes among her school books as the TV plays in the background. Moving down to the next panel – Aghgh! A mysterious hand on the window! M.J. is going to get attacked in her sleep! Quick, move to the next panel! Uh oh… aw, man… say it ain’t so, Spidey! Seriously? You are a Peeping Tom now? First, giving a doll of yourself to M.J., then having the Wasp dress up as M.J. for your creepy little encounter, and now this? 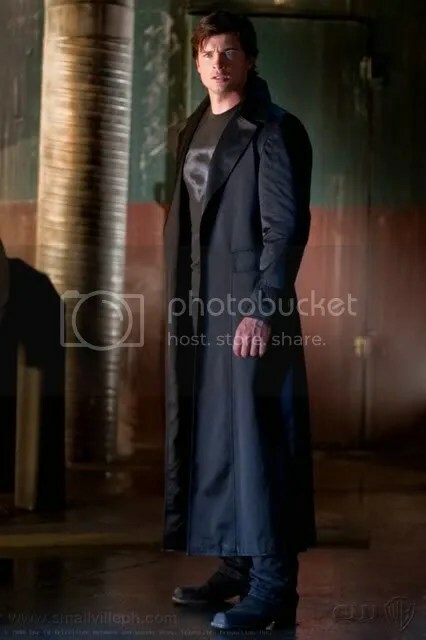 Man, I haven’t been this skeeved-out about a superhero stalker since I watched Superman Returns. Ugh! 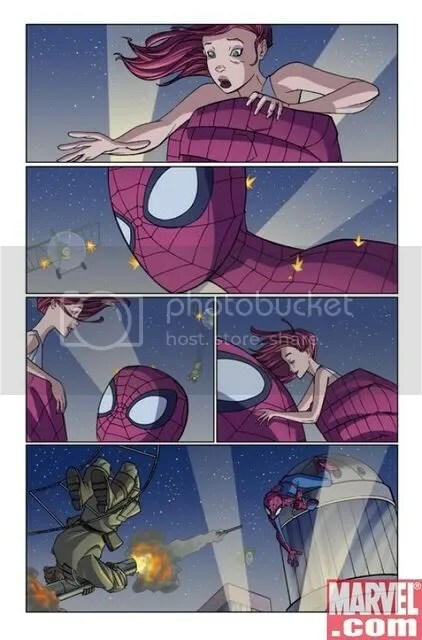 In the last two panels, we see Mary Jane, completely oblivious to the invasion of privacy, and then Spidey slips away, fearful of being caught. Thank goodness that’s over! The entire creepy context of this issue really threw me off. As such, I can only give it 138 stars out of 15,933 stars. I like my Spider-Man less stalker-y and more devoted to M.J.
Here’s to hoping the next Preview Review is less icky!